I felt sorry for the Ker 11.3 twins, Dump Truck and Much Ado V last night. Well sorrow is too strong a word and perhaps some empathy is more appropriate for as much as I appreciated lifting up from behind Dump Truck, I did not appreciate all the fleet behind lifting above us. In the sub 4 knot conditions we made a good start at the leeward end of the line and were first into Humbug on top of the earlier fleets that were still parked. Dump Truck and Much Ado V caught us on the drift through Humbug and the three of us made it out into the clear still conditions off Greenwich Point. It was here that the breeze lifted some 60 degrees allowing us to lift well above Dump Truck and Much Ado V.
We were half way to Goat Island and becalmed when the breeze lifted further and freshened from behind to a few knots bringing almost all the Black fleet up to our position. We were being passed by past Commodore Geoff Lucas in his Cavalier 28 Capriole when Dump Truck tacked onto a southerly shift and drew away. Jackpot and Flashback had joined the fray and it made for close racing around Goat Island. Much Ado V recovered from the adverse wind shifts on the way to the island to draw alongside and so the fleet parked on the South side of Goat Island waiting for developments. In the dark and quiet conditions pleasantries were exchanged between boats and issues of lack of steerage discussed. Flashback managed the rounding best and established a lead of a few boat lengths with Dump Truck and Passion X in close pursuit. The two leaders seemed to reach away with fresh breeze on the quarter but we all stacked up in Humbug drifting across the line stem to stern. Just as we crossed the line all Hell broke loose with an unexpected Southerly squall bringing the fleet home. The biggest challenge of the evening was taking the sails down in the 20 knots conditions with the late finishers all coming in from behind. We had to go a long way up the Lane Cove River to find a safe place to drop the sails. The bonus for the night was beating Much Ado V across the line. I don’t know by how much and am waiting for the official results to be posted but we might be in the hunt for the series fastest times result and it would be nice to know. Here is the update on the post following the error I found in the rating certificate. The yacht is only 12.07 metres long, not 12.7 and I hoped it would make a difference. Hope was a futile emotion as the revised updated rating came through this morning with a revised rating of 1.111. That is a mere one percent reduction and is at odds with my estimate. 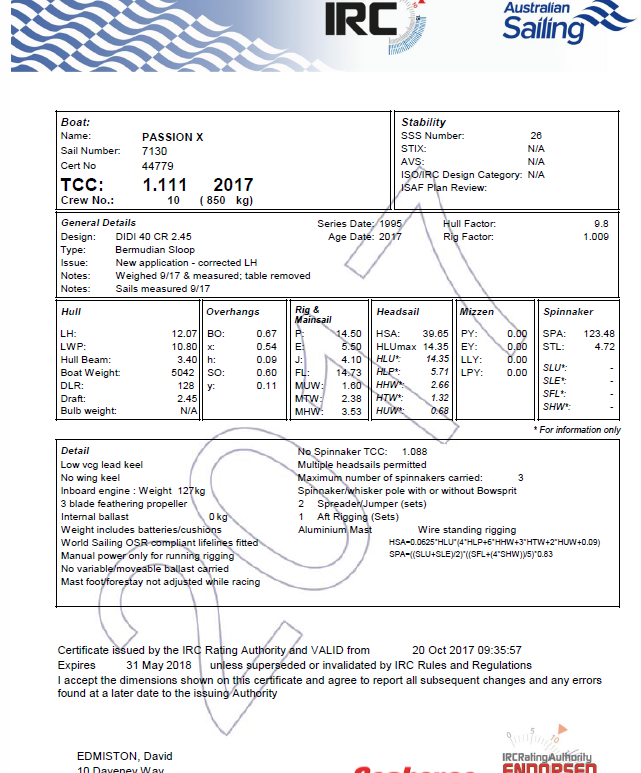 I don’t have a VPP program but based on engine power required to propel the hull I have calculated a decrease in length of the amount of the revised certificate should have resulted in a three percent reduction in speed and hence rating. This applies right through the speed range which I have modeled with 5, 10, 20 and 30 Hp power available at the engine. I would think that if an increase in waterline length of 630 mm is only going to add 1% to the rating why not go for the longer length. 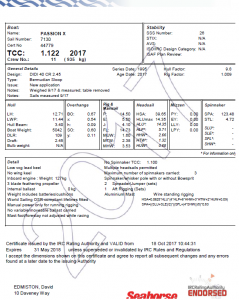 Perhaps that is why all the new fast yachts have plumb stems As I said in the initial post there is no respite in the rating wars as far as Passion X is concerned. Our IRC rating came through and we were rated at 1.122 now revised 1.111 to the same as a First 45. Black Sheep, a First 45, rates 1.108 so we would have to give this 45 footer some time. This is no surprise as the ORCi ratings are similar. We appear to be rated just a little faster than the Sydney 38′s and an A40 which we have a lot of trouble matching. A J133 would have to give us a few seconds but they usually clear out by many minutes. 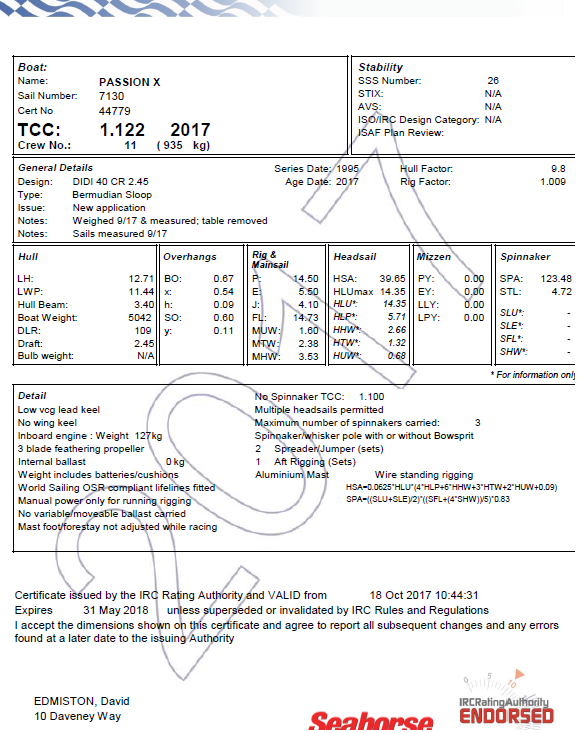 The revised IRC certificate suggests we should have a crew of 10 and all of them on the windward rail. That is about 320 kg more crew than we typically have on board. That is about 16% more righting moment and would be significant but we are not going to find that many crew. 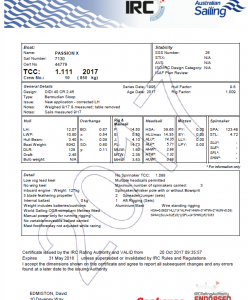 The rating does suggest we have yet to find the right groove for Passion X in terms of pointing angle and boat speed. 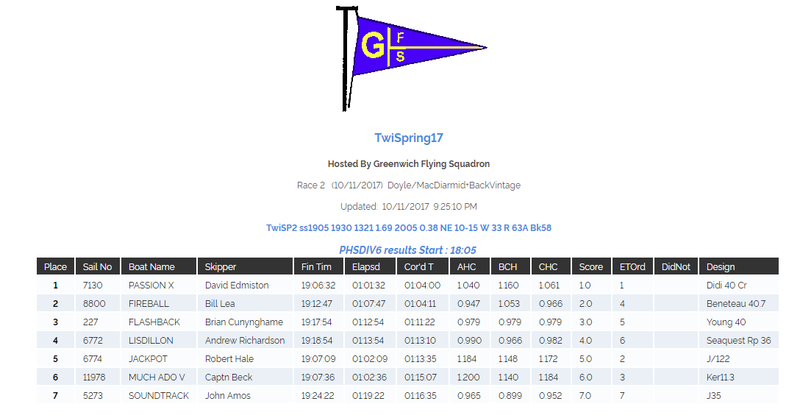 We were holding down second fastest place in last night’s windy twilight race when we decided to take out the reef in the mainsail. After losing a little ground in the reefing process it seemed like a good idea during the run down the side of Cockatoo Island but once we rounded the island and headed back to Humbug into the 22 knot winds we were not so sure. At the start the wind came in stronger and longer than forecast so we opted for the No 4 jib and a full main. Within minutes we were reefing the main as the freshening breeze hit the fleet. We were not the only ones caught with too much sail area but we had the luxury of having the small jib up and a few more options. The more heavily canvassed yachts made good progress on the reach off the start line and we were blanketed by a good portion of the fleet running through Humbug but we went low and carried the gusts further. Much Ado V was leading the fleet with Flashback to leeward and Jackpot behind. We did well on the beat to windward to Goat Island despite Much Ado V increasing her lead and Lisdillon nipping at our heels. Around Goat we made the decision to take out the reef and in the process let Much Ado V slip further away and Lisdillon pass us to leeward. The extra sail area helped up reestablish a few boat lengths lead over Lisdilloon but on the run the light weight Flashback surfed up alongside. Heading back to Humbug Lisdillon was footing just as fast and was a few metres to windward behind on our quarter making a tack difficult. Flashback was low and chanced their arm to scrape through on port in front and then it was tack for tack all the way home. Due to the large mainsail I was forced to feather the boat up into the breeze and that was not as quick as bearing away for speed. Also with the short tacking we did not settle down and get the best out of the boat. Lisdillon managed to work to the front of our little group of three while we managed to tack below Flashback on the last throw to the line and pinch up to just beat them across the line. We will never know if taking the reef out cost a place to Lisdillon or saved a place from Flashback but I will think twice before taking the reef out next time. Well done to Much Ado V for the win on fastest time. For our part we were happy with the third. I found this gem of a video of the day the Laser Masters fleet was blockaded from the boat ramps so as to give time for the Lasers to be taken out of the water. The sailors who ignored the blockade are all pretty visible on the video. The Aussie Radial fleet got a special commendation from the organizers for being well behaved and the naughty ones have been caught on video for the record. We are back. It has been a long almost four weeks and while the travel and competition in the Laser Masters World Championships in Split were enjoyable it is good to be back home. The trip did not start off well when I slipped on the launching ramp at Middle Harbour Amateur Sailing Club and cracked some ribs and it was well into the holiday before I could sleep on my left side. As the conditions in Split were very light the cracked ribs were not a problem and I did much better in the stronger conditions anyway. I was contented with my second place in the first and windiest race and with my 7th overall. The charter boats were in impressive condition and I was pleased to return mine in pristine condition.The big disappointment of the tour was that our fellow travelers were not well and Kevin was unable to sail. He put on a very brave face but it must have been a big disappointment to him too.My first activity on arriving home was to visit the doctors as I succumbed to the bugs on the last few days of the trip and was pleased that I made it home before it hit hard. Now putting all that aside tonight despite bugs and jet lag we pulled off a win on time and handicap. The breeze had been forecast to build but with a lot of cloud cover during the day the breeze was later and lighter and died earlier. We took a vote and elected to go with the big genoa. A deciding factor was the strong crew we had on board and the knowledge we could reef the main if need be. We won the start from Jackpot in the hands of new owners but with the gun dealer team on board. An interesting new competitor was Much Ado V which is another Ker 11.3 seemingly in the Beck fleet. It will be fantastic for GFS if Dump Truck and Much Ado V can match race around the course every week. Having our nose in front at Onion Point gave us a clear air advantage which we used to maximum advantage and we were able to keep in front for the whole race. A few forced tacks away from leeward shores when the breeze was lifting gave us some concern but we had enough of a gap to hand on for our first fastest times in the Black fleet. Much Ado V has an even more challenging ORC rating than Passion X so we were very pleased to beat her over the line. 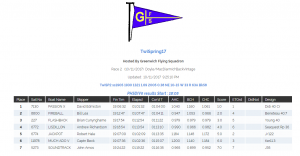 The balance of the fleet were at the mercy of the dying breeze which dragged out the time differences and allowed our first handicap win of the season.